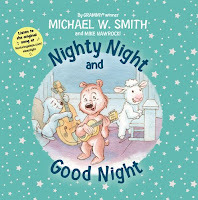 I love bedtime books and when I found out I could review Nighty Night and Good Night by well known Christian artist, Michael W. Smith, and the co-creator of the VeggieTales™ series, Mike Nawrocki, I was thrilled. First, I love hardcover children's books. They last longer and they're the ones I save for only me to read to my children. I also like that the stars and title are a silver foil which makes it shimmer. Since most children have stuffed animals, it's adorable how little Ben's toys come to life after his mom leaves the room. Since he can't sleep, they try to help him figure out a way to make him tired. Each stuffed animal gives it a go to help Ben to no avail. They finally come up with the idea to sing him a lullaby. 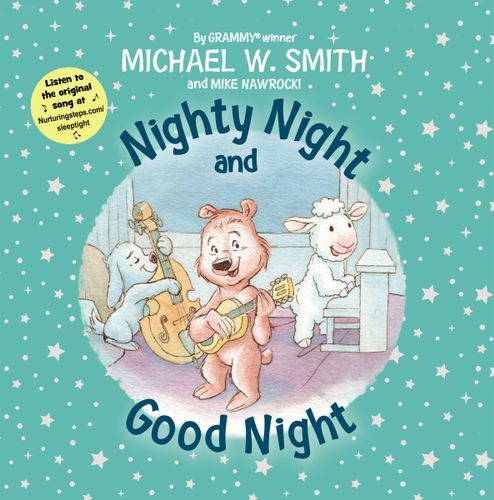 The lullaby is actually a song you can hear (and learn) with a link that is included on the book's cover. It was always so precious to me having night time songs I could sing to my children, and this would easily become a family favorite. Now, I will say that you have to subscribe to Nurturing Steps to actually be able to hear the song. The song is sweet and is classic Michael W. Smith. This will easily become a family favorite and I could see the children asking for it every night at bedtime. I'll be taking this book with me to Peru. I know a family who just adopted a baby and they'd love having this book to read to their son. The new mom is an American living down there! I can't wait to give it to them.